kick-off 2290 tax filing, Aug 31 is the Last Date! The federal heavy vehicle use taxes are annual taxes must be filed between July and August of the tax year. Mark your calendar! The regular 2290 truck tax return filing deadline is August 31, falls on Wednesday, file your returns well within the due date to get your heavy vehicles registered with the state’s and motor vehicle authorities on time. Most truckers must file their 2290 heavy vehicle use taxes for the tax year 2016-17 by August 31, 2016. IRS must have received your return electronically – or it must be delivered or postmarked – by that date. If you owe tax, you must pay by August 31, even if you file your return later. This entry was posted in 2290 e-file, 2290 for TY 2016 - 2017, American Trucking, Form 2290, Truck Tax Online and tagged 2290 HEAVY TRUCK TAX DUE, 2290 truck tax, 2290 truck tax due, 2290 truck tax efile, 2290 TRUCK TAX RETURN, Heavy Truck Tax, HEAVY TRUCK TAX 2290, HEAVY TRUCK TAX DUE, HEAVY TRUCK TAX RETURN, HEAVY VEHICLE USE TAX 2290 DUE, HEAVY VEHICLE USE TAX DUE, truck tax due on August 19, 2016 by Truck Dues. 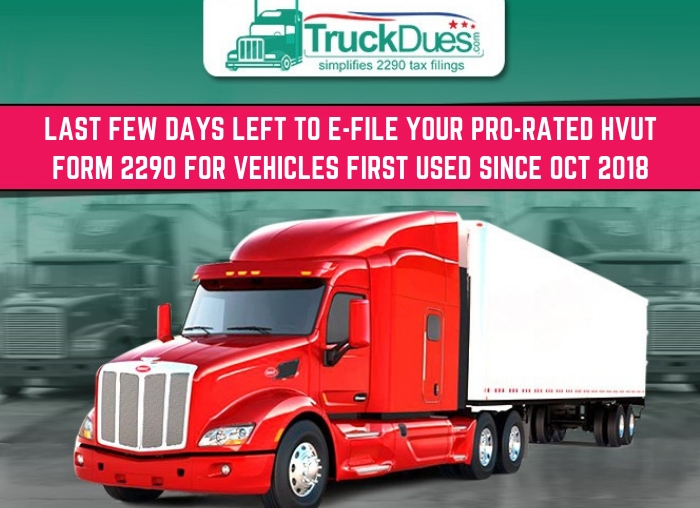 2290 E-Filing for 2016 TY has started with TruckDues.com, Start filing now! We’re ready with 2290 HVUT, Electronic Filing for 2016-17 Tax Year. Filing 2290 Taxes Online is Convenient and Inexpensive. Started accepting 2290 Truck Tax Returns for the tax year 2016-2017, the easiest and simplest way for e-filing Heavy Vehicle Use Tax Returns in USA. This entry was posted in 2290 e-file, 2290 for TY 2016 - 2017, prefile-2290, Truck Tax Online and tagged 2290 e file, 2290 efile, 2290 online, 2290 tax online, 2290 truck tax, file 2290 truck tax, form 2290 online, prefile 2290, truck tax form 2290 on June 16, 2016 by Truck Dues. Month of Jan has already come to an end; it seems like it just began. Jan 31st officially marks the deadline for Heavy Vehicle Use Tax Form 2290, and for those of you that haven’t filed yet, it’s time to get it done! This entry was posted in Form 2290 and tagged 2290 truck tax, e-file 2290, Heavy Truck Tax, highway use tax, IRS form 2290, my truck tax dues, Truck Dues Online on January 25, 2016 by Truck Dues. This entry was posted in Form 2290 Amendment and tagged 2290 HVUT, 2290 online, 2290 truck tax, Form 2290 Amendment, highway use tax, Truck Dues Online on November 24, 2015 by Truck Dues. This entry was posted in Form 2290 and tagged 2290 truck tax, Application for Employer Identification Number, highway use tax, Truck Dues Online, Trucking Tax Center on November 20, 2015 by Truck Dues. In good old days one will remember how hard it was to communicate messages between people who live far away. We had limited options either meet the person directly or mail them a letter. Everyone knows how hard both these options are, complications involved are delay in conveying the message and of course a lot of traveling involved, which is time consuming as well. This entry was posted in Form 2290 and tagged 2290 HVUT, 2290 tax support, 2290 truck tax, e-file 2290, efile Truck Dues, Heavy road tax, Heavy vehicle tax, How to file 2290?, Truck Dues Online on November 9, 2015 by Truck Dues. So filers, how are you doing? Hope everything is on smooth grounds. Last week we had spoke about the security levels we maintain at TruckDues.com. However, today we are going to talk about the vehicles filed through form 2290. Yes, this application supports varied type of vehicles that need to be filed on or before the taxation season due date. The next set of vehicles file form 2290 is suspended vehicles. These vehicles do not cross the minimum mileage i.e. 5,000 miles and 7,500 miles for agricultural purpose and thus, they’re not required to pay dues, however, they need to keep IRS informed about their suspension through form 2290. However, do note, annual miles exceeding more than 5,000 and 7,500 miles for agricultural vehicles are calculated as taxable miles. You need to file Form 2290 Amendments to pay your dues and receive revised schedule 1 copy. After taxable and suspended vehicles, exempted vehicles are the operated and maintained by the government itself and that is why they don’t have to pay any dues to IRS, however, they need to report form 2290 for their vehicle. These vehicles are exclusively used for the conduct of logging operations. The vehicle is registered as highway motor vehicle and used exclusively in the transportation of harvested forest products. In addition, no special tags are required. Agricultural vehicles are involved in harvesting and transporting agricultural goods, and the maximum mileage is 7,500 miles annually. Primarily used for farming purpose. Registered under the highway motor vehicle but they are exclusively used for farming and agricultural purpose. In addition, there are no special tags to differentiate the vehicle. With this, we would like to remind you that if you have bought your vehicle on road for the first time in the month of August, you’re liable to file form 2290 by 30st September. So come over and file with TruckDues.com and experience anew. Get in touch with our Tax Expertise at (347) 515 – 2290 or simply drop in a mail to support@truckdues.com. We are here for you, for better back-end support. This entry was posted in 2290 e-file, 2290 for TY 2014 - 2015, Form 2290, Truck Tax Online and tagged 2290 dues, 2290 HVUT, 2290 tax online, 2290 Tax period 2014 - 2015, 2290 tax support, 2290 truck tax, Agricultural Vehicles, efile Truck Dues, Exempted vehicles, Form 2290, Heavy road tax, Heavy Truck Tax, Heavy vehicle tax, Heavy Vehicle Use Tax, highway use tax, How to file 2290?, Logging Vehicles, my truck tax dues, report 2290 online, Suspended Vehicles, Taxable Vehicles, Truck Dues, Truck Dues Online, truck tax 2014 and 2015, truck tax dues, Trucking Tax Center, Types of Trucks, Types of Vehicles, Vehicle Use Tax, Vehicle Use Tax Online, What is for 2290?, Why choose Truck Dues?, why efile 2290? on September 16, 2014 by Truck Dues.